Godwin Muti was one of the first people to descend on Chiadzwa when word spread that diamonds had been discovered in the arid and impoverished part of eastern Zimbabwe. Mr Muti, 31, an unemployed father-of-two, was wallowing in poverty. He could hardly pay rent for a one-room house where he lodged in the old township of Sakubva in Mutare city. When he heard about the diamonds, he joined thousands of others in the rush to Chiadzwa, then an unknown and desolate place. A few months later his life had been transformed. Suddenly he was living in the middle-class suburb of Dangamvura, the proud owner of a sedan car and a number of homes that had been beyond his wildest dreams. Dealers flocked to Mutare from all over the world, including South Africa, Mozambique, Nigeria, Guinea, Mauritania, Lebanon, Iraq, Israel and Belgium. So once Mr Muti got the diamonds from the fields he could immediately sell them. They were prepared to part with as much as $200 (£134) per carat - a handsome price considering panners could sell stones up to 15 carats. Mr Muti's only problem was the police and their dogs that would constantly chase him and his fellow miners from the fields. But Mr Muti, and thousands of others, soon found a way round that obstacle - they formed syndicates with the police officers manning the fields. Suddenly, poor police officers earning less than $10 (£7) a month were driving new cars too. The authorities launched several operations to rid Chiadzwa of illegal miners but the hunt for precious gems continued unabated. Then three weeks ago Mr Muti was surprised to see helicopters hovering over the diamond fields. Then heavily armed soldiers arrived. 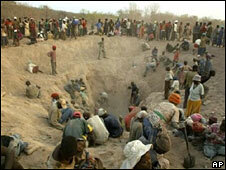 That was the beginning of a brutal campaign to remove illegal miners and the diamond-dealers once and for all. It was dubbed Hakudzokwi kumunda, meaning "Operation you would never go back to the diamond fields". Reports then began to filter through that bodies of dead panners were piling up at the mortuary in Mutare Provincial Hospital. Nineteen decomposing bodies at the facility have still not been claimed. This prompted the police to make a public appeal last week to relatives with missing loved-ones to visit the mortuary. "The hospital authorities have said their mortuary is not working well and the piling of bodies is straining their facilities," said police spokesman in Manicaland, Inspector Brian Makomeke. "Some of the deceased panners might be foreigners and we are not sure because they had no form of identification." An unknown number of bodies were scattered in the forests surrounding the fields. Several had died from gunshot wounds while others had succumbed to diseases like cholera. About 20,000 illegal panners, who had come from all over Zimbabwe to make the diamond fields their permanent homes, fled in all directions. 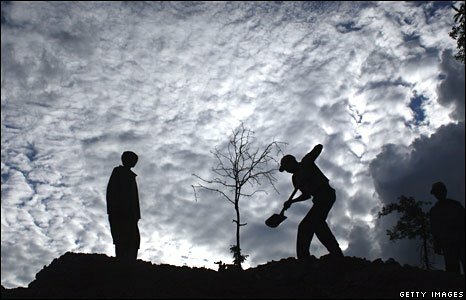 Within a week of the operation there was not a single miner left in the diamonds fields. Mr Muti was lucky to escape unhurt. But he says it was hell and vowed not to return to the fields as long as the soldiers are there. "I thank my gods I escaped unhurt," he says. "It was hell on earth. The soldiers are shooting to kill." Crisis in Zimbabwe Coalition is calling for the alleged violations to be documented so the perpetrators can be brought to justice once normality returns to the country. 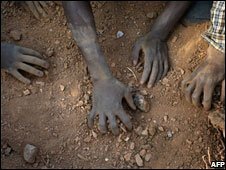 Zimbabwe Lawyers for Human Rights accused the army of heavy-handed tactics to remove the illegal miners. And the regional co-ordinator of ZimRights, Reverend Stephen Maengamhura, accused the authorities of "a wholesale violation of rights". He puts the number of bodies in mortuaries across the province at 106. "I am not employed and this was my only means of survival," Mr Muti says. Why should I suffer when I can easily go to Chiadzwa and become a rich person? "I may now be forced to sell what I bought when I was in Chiadzwa." His story is similar to that of thousands of other desperate Zimbabweans who descended on Chiadzwa, seeking instant fortunes. Teachers, especially those in schools close to the diamond fields, abandoned their classrooms to join the diamond rush - their pupils followed. Even factories and industries were left with skeleton staff after workers downed tools and headed for Chiadzwa. Moses Mawire, 37, a senior mathematics teacher at a secondary school close to Chiadzwa, has not reported to duty for almost a year now. "Why should I suffer when I can easily go to Chiadzwa and become a rich person?" Mr Mawire said. The reporter's name and those of the diamond miners have been changed for their protection.